Somewhere you’ve never been. Something you’ve never seen. » Mad Mavis v’s Yellowstone: The battle of the road surface. 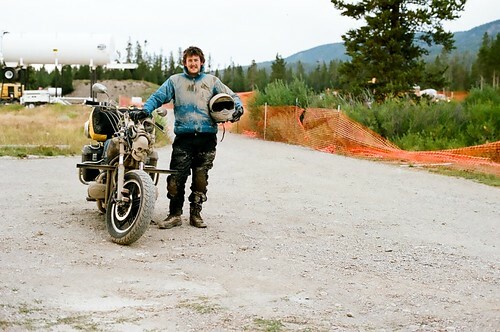 Mad Mavis v’s Yellowstone: The battle of the road surface. With a light drizzle starting to quantify, the Wyoming roads before us glossed over with a shimmery wet shine. The ping of rain drops against the helmets outer shell made a rhythmic chorus of percussion. Sights were set on reaching the interior of Yellowstone National Park on the border with Montana by sundown. Making what was thought to be good time, Mavis was given a rest from the thrashing of days prior. 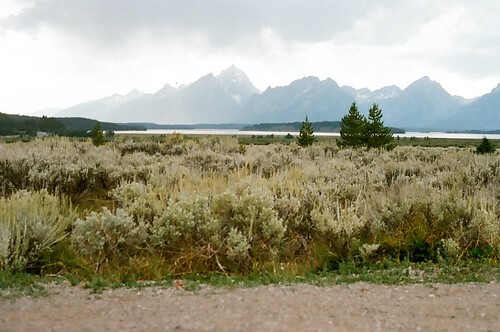 Across the plains we traveled, gradually once more returning to altitude within the Teton Range of the Rocky Mountains. 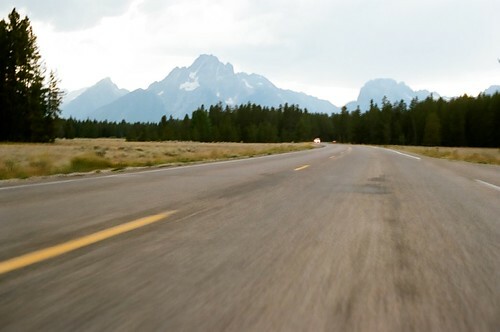 Hitting Jackson, Wyoming (also know by, Jackson Hole) we rode into town, a swarm of traffic engulfed us as we searched the bustling street for a petrol station. The town was most definitely worth the time to stop, look and explore, but with the ever common lack-of-funds setting up “base camp” within my bank account and a falling sun, a decision was struck to grab a quick bite to eat and depart for a campsite within Yellowstone. Passing the Teton Range and more notably the peak of Grand Teton, the pure majesty of the mountains threw me from Mavis (theoretically speaking). Such unanticipated natural grandeur bestowed a sense of humbleness to myself and the motorcycle on which I rode. Onwards we rode to the sounds of thunder claps and flashing bolts of lightning striking the ground before us. Trying to capture this moment on film, I reached forward and pressed the shutter button atop the camera mounted to Mavis’ side. 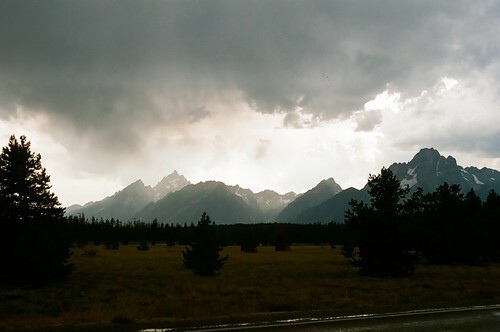 The rain soon followed which is to be expected following such dramatic weather as we entered what was thought to be the entrance to Yellowstone National Park. Ahead either side of the road, thick forest interspersed with shallow clearings, revealing glimpses of cascading rivers. Icy rapids tumbled one over another in a race against gravity. Snow capped peaks jutted out above the trees. A few more miles down and the road narrowed to where a small ranger hut stood. “Welcome to Yellowstone”. 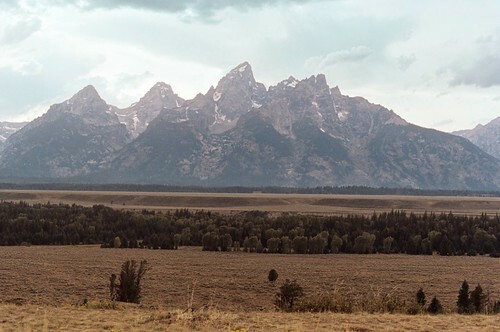 Unbeknown to me, the Grand Teton NP boundary extended further north before smashing into the great Yellowstone NP. Light started to escape the day as a large illuminated sign read “Roadwork ahead. Expect long delays”. Further north and I soon pulled up the rear of a line of cars. Workman and plant equipment busied about on the road-surface. A small truck pulled in front of the lead car as I stretched my legs and jumped about. “Pilot car. Follow me” read the back of the work utility as its amber lights pulsated. Like a freight train exiting a siding yard, one-by-one the cars before Mavis pulled away as I hurried to replace my helmet and gloves and start up the bike. 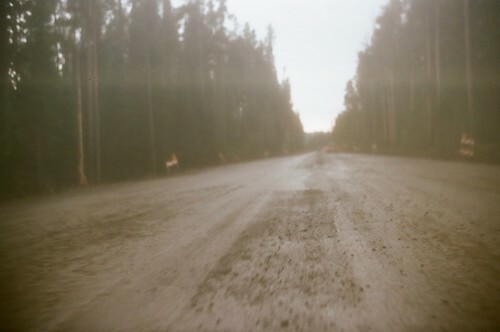 The pilot car picked up pace while the sealed road disappeared below, replaced by slick mud, loose gravel and potholes. Vision soon became impaired as the road relocated to my visor and the rest of my body, Mavis’ headlight and my mesh gloves. Unsuccessfully I tried to wipe the mud and grime free of view which was quickly replaced with more in it’s place. Frustrated yet happily bemused, I flipped the visor up and placed my left hand in front of my nose to protect my exposed face from the grime while my right worked the throttle and steering. 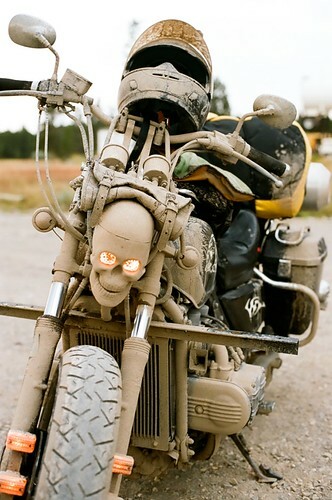 No time to stop, nor slow down, the mud kept coming while my eyes blinked rapidly to stave off the foreign matter. Five odd miles later the sealed rode returned, the pilot car pealed away and the line of traffic resumed cruising speed. Covered head to toe in mud, I laughed, smiled and then hit myself for thinking riding without a front fender was oh so cool. Crossing a small bridge, I turned off and rode down to a rivers edge. I rinsed what I could free from my gear and splashed the cool water over my face. The helmet visor was completely ruined, small scratches and a light film obscured my view. With nothing else that could be done, I resumed my hunt for a campsite for the night further deep within Yellowstone National Park.